While we're not going to get all descriptive about what guys do alone in bed, we are going to marvel at how wonderful it might be to have bed linens like the ones here created by Duval Guillaume Antwerp for their client Che Magazine. On those lonely nights when you just can't get the real thing, a nice, soft set of sheets and pillows emblazoned with your dream hottie just might help you fall asleep more easily. And yes, we hope that's all you'll be doing with the sheets. - Perhaps in yet another effort to convince people to choose a certain drug, their are now pillows branded to look like pills. - Cynopisis reports, "CBS has pulled 3 LBS. from the schedule after just three airings. The show debuted with a modest 2.9 A18-49 rating, and its most recent airing pulled an even more modester 2.4 demo rating. Filling the time period for the time being - reruns." - After years of negotiations. Omnicom has scooped up Amsterdam-based independent shop 180. - For those who can't seem to acquire enough friends on MySpace or Facebook, John Brock tells us now there's Fake Your Space, a sit on which you can pay $.99 per month for each "hot friend" of your choice who will send you two comments each week to make you feel special. - The famed Anastasia Goodstein of Ypulse will host a roundtable discussion on "What Youth Brands Can Learn From The Action Sports World" at the Ypulse Teen Media Mashup on December 5, 2006 in San Diego. - This has nothing to do with advertising or does it? A clandestine promotion (not that they need it) for Grey's Anatomy? - Oxfam America is looking for pro-bono pring and online media placement opportunities for its Unwrapped campaign. Interested parties can contact mslabyak@gold-group.com. - If you want to see Mullen Creative director Edward Boces holding a giant cookie above his head, check out the agencies just-released recipe book from their famed, in-house kitchen. You know we're in the midst of an era-shifting marketing mashup when one of the oldest media out there, flip books, gets into bed with over-hyped medium du jour Second Life. That's right, my friends. 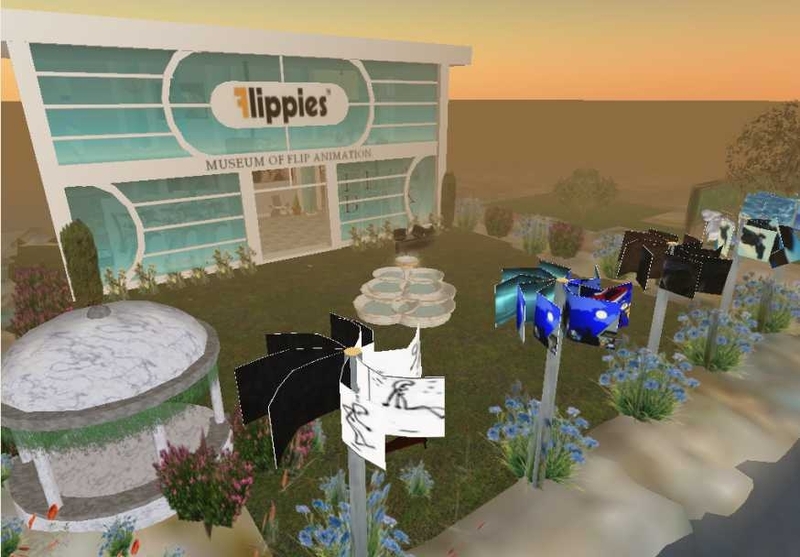 Flippies, the company that turned that old medium into something new again for marketers has created a Museum of Flip Animation in Second Life. At the Museum, visitors can check out the early history of animation, play with a flip book machine and check out Flippies' latest creations. "As a long-time collector, being the curator of a museum dedicated to the art of flip animation has always been a dream. Second Life has made it possible for that dream to now become reality." said Flippes President Jeffrey Kay. You can check out some images of the Second Life installation here. - If your nose explodes it's because you've just opened the upcoming special holiday issue of People magazine which contain no less than five smell-o-rama ads from Kraft. Oh, and all the rest of the ads in the issue are from Kraft as well. Wear your nose plugs. - Cynopsis reports "NBC Universal has begun layoffs based on its NBCU 2.0 plan designed to tighten budgets in every department which will increase efficiency company-wide. The broadcast TV side will absorb much of the 700 expected layoffs, with the NBC News division taking the bulk of the hits. In this first round of layoffs, at least 17 employees affiliated with Dateline NBC will lose their jobs." - This idea is so not new but no there's company formalizing advertising on nightclub wrist bands. - The poor guys over at Agency.com just can't catch a break. - Obligatory "hot babes promote TV show" link. - Somebody likes golf balls. - Obligatory S & M food promotion link. 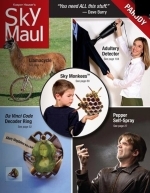 - Sky Mall catalog gets Mauled (click upper right hand corner of page to flip through the catalog). - Adrants readers Matt tells us he saw ads on the bottom of the plastic bins used to transport items through security check at LAX. We're not sure what company's behind it but we've never seen it before. - Media Bigwigs Martin Sorrel, Sir Harold Evans, Dan Rosensweig and Mel Karmazin battle about old media versus new media at a recent Digital Media Revolution panel discussion. - MediaBuys is again handling sponsorship programs for this year's Mardi Gras. Revenu from sponsorships will help the city continue to rebuild itself. A television special will follow the event highlighting the event's history and offering up a bhind the scenes look at Mardi Gras. Selling coffins is usually a somber affair but not for this Italian coffin maker who promotes coffins with a calendar full of lingerie-clad women draped over the company's line of product. It sure is better than the usual shriveled, wrinkled look one might usually associate with death. 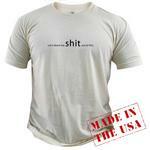 All they need now is a Chippendale's version for the ladies. If there are still college students who use notebooks versus laptops for note taking then a new company called Unotes just might have an interesting new method of advertising to the hard to reach demographic segment. Launching in January, Unotes plans to take the lowly 5-subject notebook and turn it into an ad medium selling glossy four color divider pages, the back cover and watermarked pages and using that revenue to provide the notebooks to students for free. There's a charity angle as well with part of the proceeds going to First Book, an organization that provides books to children of low income families. We've seen the prototype and we like what we see. The program will role out nationally in September. Along with Unotes notebooks, the website yet to launch Unotes.info will offer a virtual world of sorts which will mimick a college campus and college town complete with, yes, embedded brand promotions and other good stuff such as branded ringtones, MP3s, screensavers, wallpaper, buddy icons, video clips and advergames. It's not up yet so we can't comment on its viability though it's intended specifically not to be a Facebook-like place but rather an environment full of deals which studdents can seek out. Back in October of 2004, we wrote about Advercan, a company that affixed labels to soda can tops so marketers could place advertising on cans. 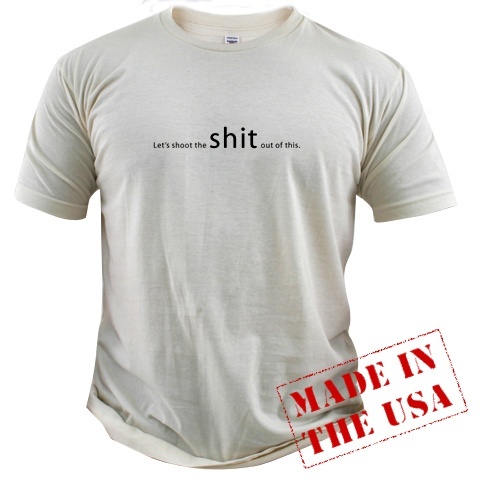 While we liked the idea, we chided the company pointing out all those labels would do a good job keeping landfills busy. Making nice, the company has now introduced a new labeling product that is pulp-based, biodegradable and completely hygienic. Advercan is working with Innovia, 3M and Alcan as well as beverage companies pepsi, Coke, Cadbury Schweppes, Miller and others to make cans a viable advertising medium. Not a bad idea since no one watches TV anymore but everyone still drinks flavored sugar water from a can.